The supervolcano under Yellowstone National Park in the USA erupted in 2037. After humanity dealt with the fallout and apocalypse of the natural disaster, they were amazed to find dinosaurs had emerged. An ecosystem had been sustained in a “pocket” under the volcano, and the thin layer of cooled lava had cracked during the eruption. The dinosaurs re-entered the world, finding the climate more suitable after the changing temperatures brought on by the eruption. By 2093 the first human settlement near the volcano was created in Wyoming. The pioneers involved named themselves Neotechnoists, and would eventually thrive into an advanced society of relative peace, prosperity, and order. 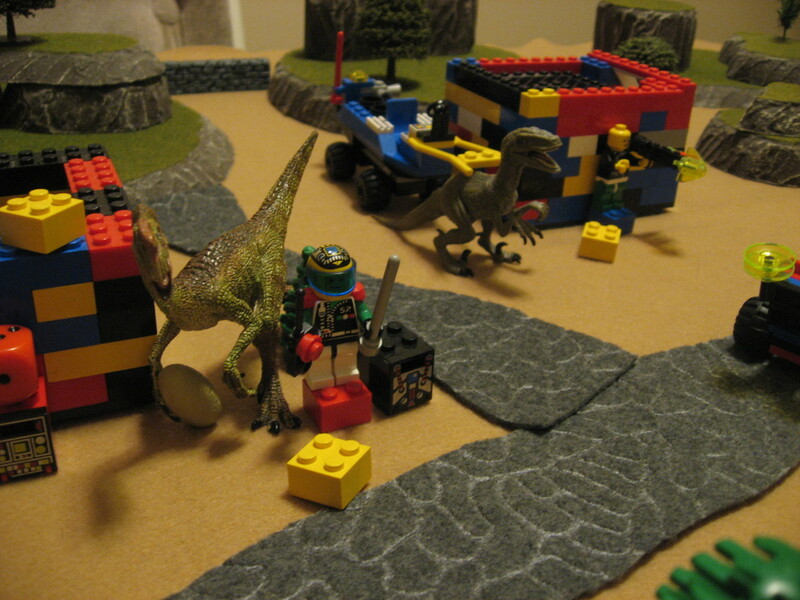 To protect from roving dinosaurs, and desperate survivors, they erected a massive Wall around their jungle territory. Those outside The Wall are called Dusters, and live a wild west lifestyle on the rugged frontier. Brutal Savages, removed from civilization, are a constant threat. The gap between civilized Neotechnoists and rugged, rural Dusters grows with each year. My flagship game! Hours and hours over years and years, all from a random novel idea in 2009. Has superb mechanics (biased opinion) and is very well fleshed out, extensively playtested, and quite refined. The background above is a tiny, not-very-well-condensed version of the History section of the rulebook. But basically think of Neotechnoists as somewhat like the British Empire, with Dusters a bit like cowboys or the old US or remote colonies. The dynamic between tough rural and soft, sophisticated urbanite has always interested me. 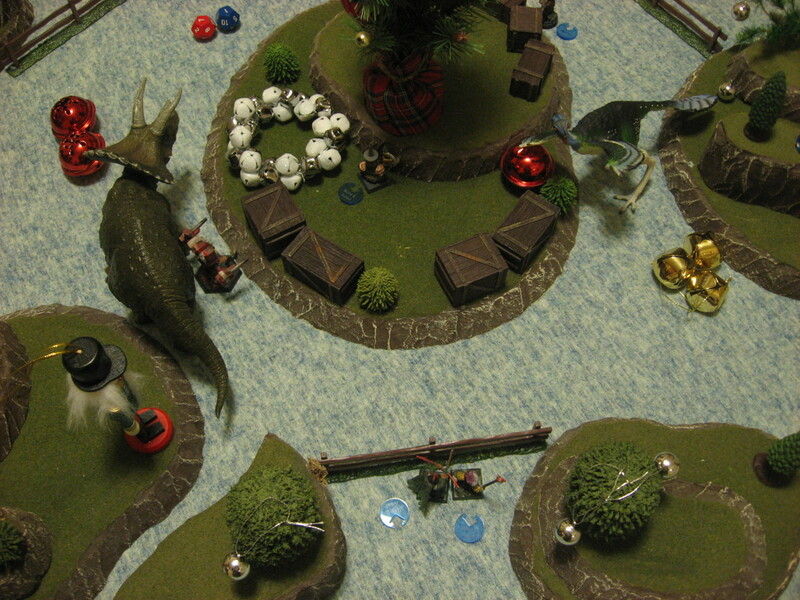 The gameplay is a fast playing (45 to 60 minutes) using miniatures in a skirmish setup of competing posses composed of up to 5 members and a dinosaur. Each character in the posse can be customized to fulfill a different role and purchase weapons and equipment from the many options available. You recruit members, choose their Allegiance, customize their stats with a point buy, and equip them using Neodollars. Turns are alternating activation on a unit-by-unit basis, meaning there isn’t a long wait before you get to do something. Each unit can move and act (in either order). 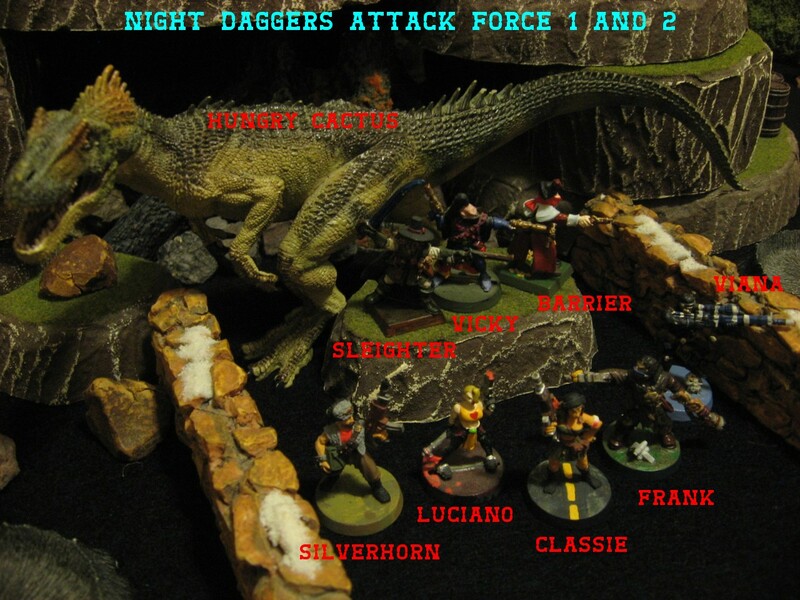 Combat is resolved from a single set of D12 dice rolls, using X number of attacks (based on the weapon and situation), trying to get above a Target Number (calculated from shooter skill plus modifiers). Weapons can jam or need to be reloaded, and also get Critical Hits. Facing and position (such as elevation) matter. The core mechanics are quite streamlined and simple, as the 9-page ruleset above can attest (especially considering 5 of those pages are Posse Rosters). There is a well fleshed out campaign system, similar to the glory days of Necromunda. 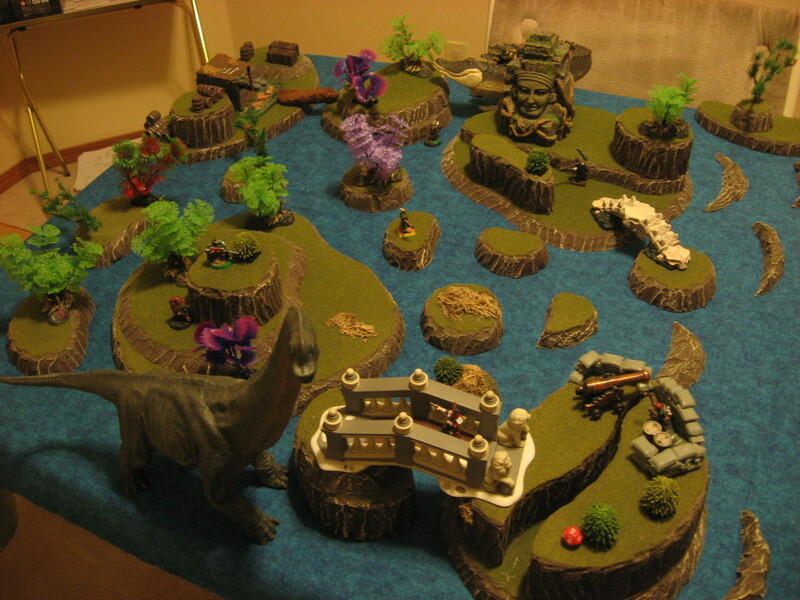 Lots of dinosaurs, a huge array of weapons and armor, and plenty of neat deployments, objectives, and table features to add variety. I came up with the idea while writing Nanowrimo in 2009. I brainstormed some rules, playtested, and honestly have kept the same core resolution mechanic since then. What did change was the game originally was RPG focused with a 90/10 split towards skirmish. Basically I built on my Drylands knowledge. But I wasn’t super satisfied with the result. Sure, it was fine. But the game didn’t pull me in or make me want to keep playing. And I wasn’t at a point in my life where a cooperative RPG would really work because I didn’t have a steady game group going. I also realized the addition of “sidekicks” to the party basically made it too light for an RPG, but too heavy for a skirmish. 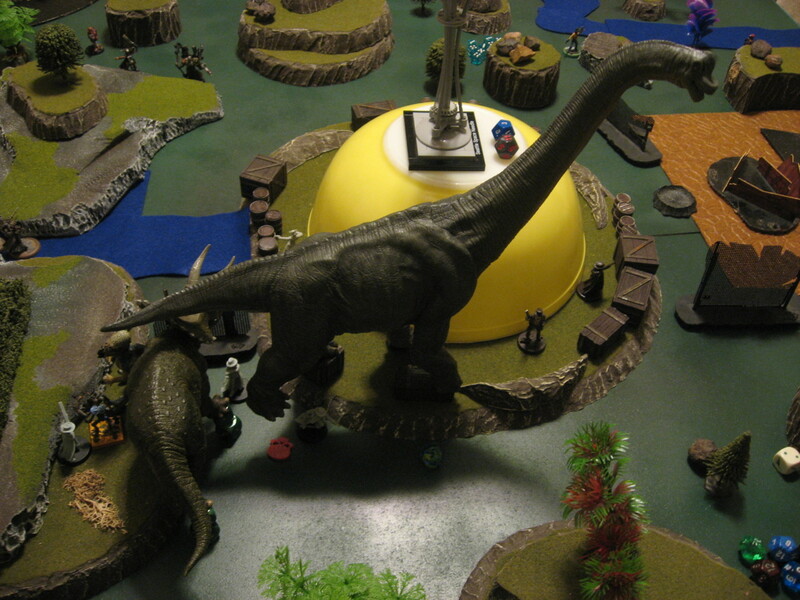 So almost a year later in 2010 I decided to rewrite the game as a skirmish. Pretty much swapping the focus to 90/10 skirmish/RPG. The first version was ready in 2011. I refined heavily until 2013, with the release of v2.0. Then I’ve been tweaking ever since, but haven’t made any changes in ~year (at the time of this post), so the game finally feels “done” and stable. I’ve also built an extensive “posse creation tool” called The Saloon, which exports beautifully organized and filled-in PDF rosters for immediate game use. I’ve played a lengthy, months long campaign with the system (called the Battle to Seattle). Tons and tons of games with a wide variety of players. All in all I’m really happy with where the game is at. 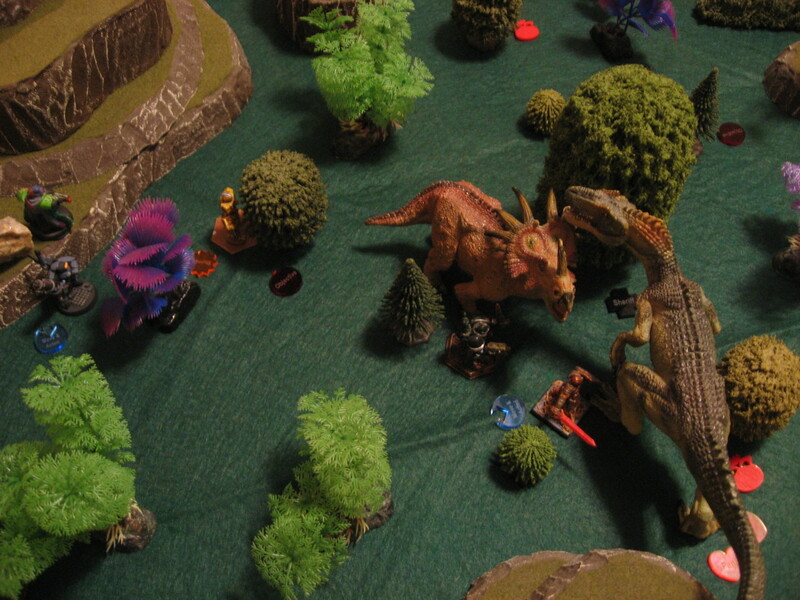 I learned the most and grew the most as a designer with Dinosaur Cowboys. I feel like I really went from an amateur designer throwing together mostly untested, unformatted rules to a competent designer who can create well structured, tested, and most importantly fun to play games. Similarly creating a beautiful, functional, refined posse roster felt pretty neat. 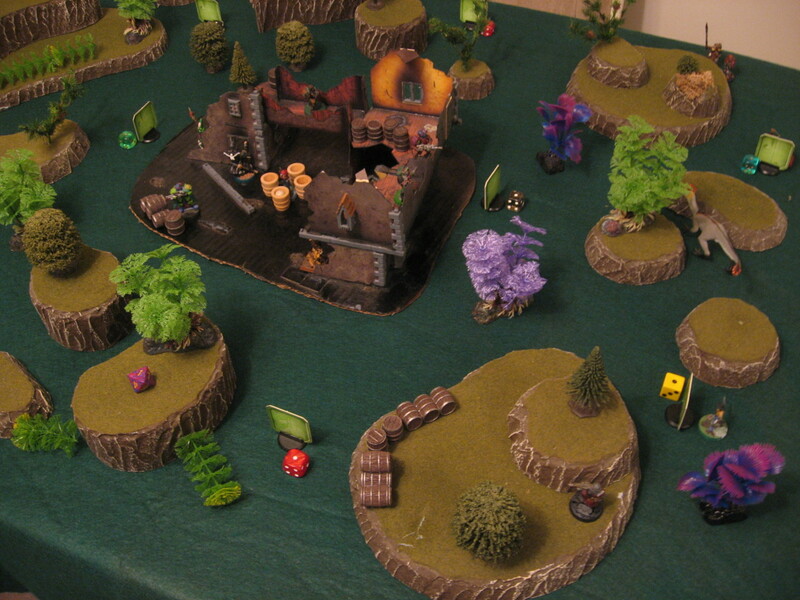 I even look back at the old Mordheim sheets and think “well, mine is better“. It’s not just about looking good, as I tweaked and improved the sheets to have many useful features that codify a lot of the short hand or notes people manually do (such as marking a trait used, doing calculations automatically, leaving space to track stats, etc.) The same goes for the quick reference sheet, and to a certain extent the weapon list tables. 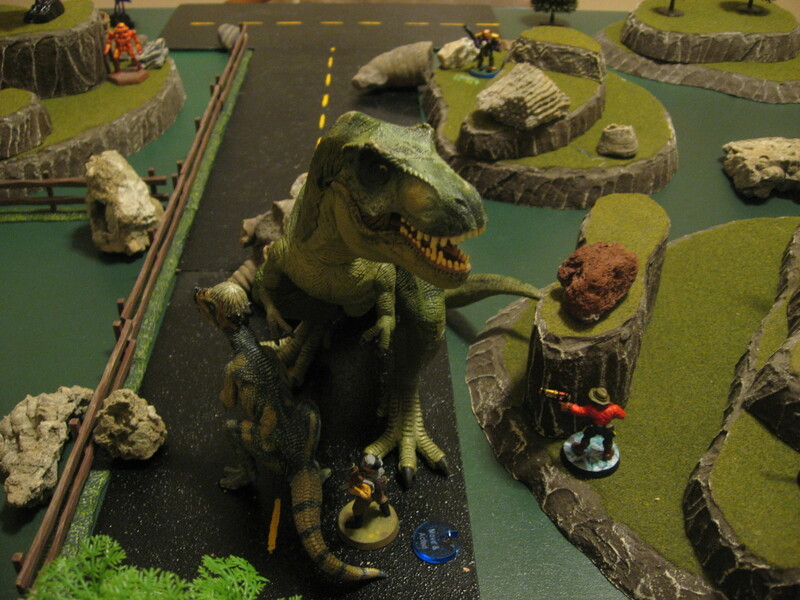 One of the most noticeable changes from my early game systems is the one rulebook approach with Dinosaur Cowboys. Before this game I tended to make multiple documents, but didn’t combine or format them with a table of contents, title page, etc. Whereas with DC having a single, organized, concise PDF really feels professional and easy to use. Also looks amazing when printed and bound. I let go of a lot of my old childhood/traditional hang ups with rules for Dinosaur Cowboys. Like asking WHY have XP Points, or why multiple dice types were needed, or even why the order of a turn needs to be set. Also really organizing the rules for a new player, where instead of diving into character creation (just because D&D does that) I actually explain the basics of the terminology, system, stats, and world. The road has been long to get here, but Dinosaur Cowboys might just be the best, most complete, most well done game I ever make.